Making inferences can be difficult for young readers. 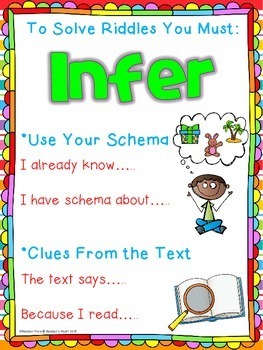 Inferring can be even more difficult for our ELL students and our students of poverty because many of them lack the background knowledge and schema needed to make inferences. Using riddles is a great way to introduce students to the task of inferring. 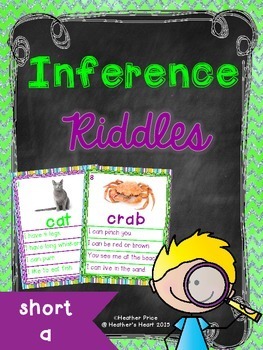 In this packet, students will practice inferring riddles with short a words. Each short a word has 4 riddle clues. 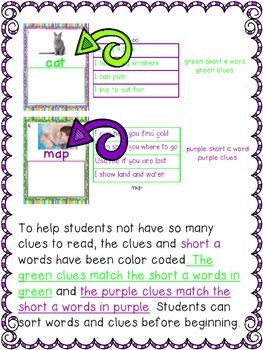 Students will read each riddle clue and infer which short a word the clue belongs to. The students will then sort the riddle clues. A recording sheet is provided. On the recording sheet, students will record the riddle clue that helped them the most in making their inference for each short a word. The packet also includes 1 short a riddle assessment sort. 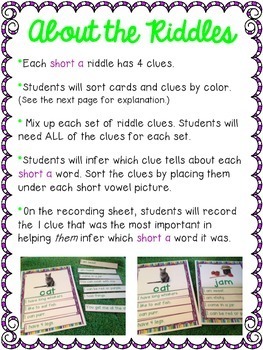 To extend the activity, 2 different recording sheets are provided so students can also write their own short a riddle. The riddles can be used whole group or with a RtI/reading group. The riddles provide students with hands-on opportunities to infer and discuss their inferences. Plus, students have tons of fun becoming inference detectives! Be sure and download the preview to get a closer look at everything.